The Bookmark Widget – Hey. Ask us anything! Collect articles, ideas, and stories from anywhere! Save them to your monday.com account using the bookmarks widget! Easy to use and perfect for quick reference, this widget will display bookmarked items in a concise list. Keep reading to learn more. Once on the dashboard center, select "Bookmarks". Once added, you can rename your widget. To do so, click into the text box that reads, "Bookmarks". You can then rename the widget as you please. How to delete or duplicate it? To delete, rename or duplicate the Bookmarks Widget, simply click on the three horizontal dots that will launch a menu. Select the action you desire. 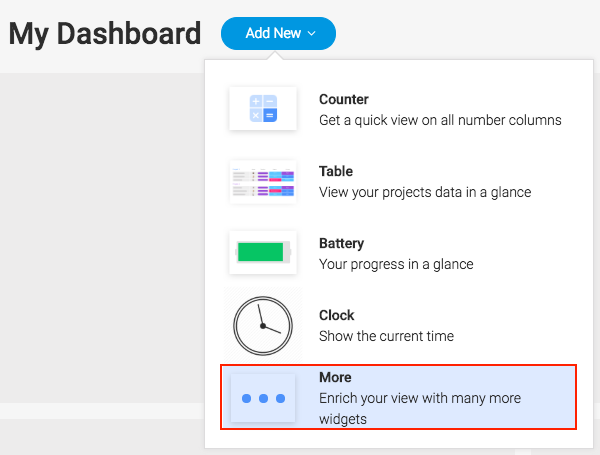 Once the widget added, click into the box that reads, "create a new bookmark" . Copy and paste the link you are trying to bookmark. Press enter to save. The bookmark bar will appear with the link displayed two times. To edit the label of the bookmark, click into the top text box displaying the link. Rename the bookmark label. Press enter to save. Add as many bookmarks as you please! Save videos, articles, useful websites, etc. To delete a bookmark, click on the trashcan next to the bookmark.